The Mayor Alderman Brooks and his wife inspect the contestants of the Fancy Dress party held at Hertford Town Football Club. All part of Queen Elizebeth ll Coronation Celebrations. This page was added on 03/03/2011. Hi Penny, Hertford celebrated all that week – on the actual coronation day, Tuesday 2nd June, there were sports, bands, fireworks and dances at the corn exchange. 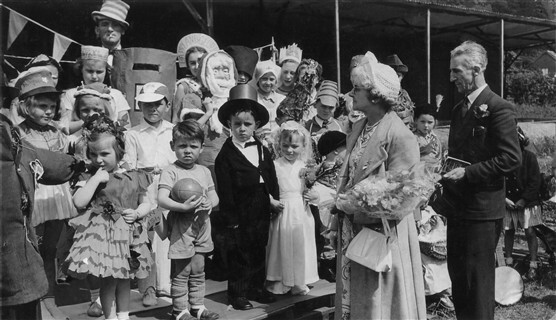 On what date did Hertford celebrate the Coronation in 1953? I have a photo of people watching a procession by the Stag in Parliament Square. The people are dressed in coats so perhaps it is not June?